A few months ago, I wrote about refreshing rural planning policy to encourage more rural investment, more diverse and sustainable rural economies, and thriving rural communities. Since then, respected Haddington-based surveyors and architects Chalmers & Co have taken the lead in moving this agenda forward in East Lothian. The firm spotted what they saw as a gap in the pre Main Issues Report public consultation – plenty of engagement with urban communities, but little with rural communities. 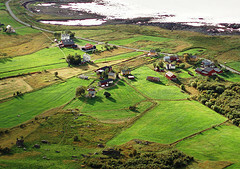 With publication of the Council’s Main Issues Report postponed until 2013, Chalmers & Co took the initiative to make sure that the next generation of rural planning policy is informed by those who live and work in the countryside. In a pioneering approach to public consultation and planning policymaking, Chalmers & Co and East Lothian Council have partnered in a cost-effective way to seek out that critical East Lothian ‘rural voice’ to inform the Main Issues Report. The main element of the partnership approach, alongside an online questionnaire survey, was a Rural Voice workshop run in late November 2012, which I facilitated with my colleague Richard Heggie of Urban Animation. The workshop brought together around 40 farmers, rural businesses, landowners and agents, community groups, Council representatives and other government organisations in an informal 2 hour workshop. Together, this cross-section of rural society explored what a thriving East Lothian countryside might look like in 10 to 15 years time, and gave valuable insights into how planning policy might help that vision to become real. East Lothian already makes much of its beaches and golf. Some participants suggested why not encourage more adventurous recreation too, such as Glentress-style mountain biking in the hillier areas away from the coast? No-one wants to see sensitive areas ruined by development, but there was a widespread view that the countryside and villages could absorb more development – so helping create jobs, bring in younger people, and help to sustain village populations and facilities. There was a strong call to make planning more development-friendly. The planning system should encourage landowners, farmers and businesses to invest in job-creating development and new homes – provided that developments are small-scale and well designed. They should benefit local communities (for example by providing a mix of houses, small and large) and certainly shouldn’t swamp villages with suburban development. And we should free up the policy around replacing redundant rural buildings. Better infrastructure – broadband, mobile phone signals and transport – was seen as critical to making village communities more attractive places to live and set up new businesses. It would also help existing rural businesses to be more competitive. A number of people emphasised the importance of linking up local planning policy with local economic development policy – something which we will follow up in taking the discussion forward into policymaking. So, with these changes, what would a thriving countryside look like in 10-15 years’ time? The answer from the 40 folk at the workshop was more profitable and diverse farms, more people working in small businesses in villages and the countryside, more homeworking, less need to commute, more families and younger adults in villages, more demand to sustain local schools and services, and a greater range of homes and jobs. A vision which I would say is entirely consistent with the Scottish Government’s overarching aim of planning for sustainable economic growth and the rural aspects of national Scottish planning policy. The Rural Voice initiative may be local to East Lothian, but it has lessons for local authorities across Scotland. Thefresh’no’lo approach makes the most of shrinking consultation budgets by sharing the costs with local partners – but avoids the danger of skewing the results towards specific agendas by using external facilitators and designing the approach in close partnership with the local authority. Organising the workshop through a respected local partner like Chalmers & Co helped to increase participation in the workshop, drawing on their networks and credibility in rural East Lothian. There are improvements that could be made with hindsight and a larger budget – such as involving a group of young people, an age group who were missing from the workshop. But that does not diminish the value of the workshop that took place. The workshop is only half the story: over the next few weeks we will be working with the local authority to explore how the aspirations of the Rural Voice can be translated into Main Issues Report questions, a preferred option, and ultimately rural planning policy. An important part of that will be to look at how planning policy dovetails with other economic development and community planning policy. All in all, it’s a fascinating initiative, and one which holds the promise of creating a new, proactive and integrated approach to rural planning policy – one which will help our countryside become a thriving part of Scotland’s future.